Our roller bearing headsets arrived and I thought you'd like to see photos. BTW, we're calling them roller bearing, rather than needle bearing, because that's technically the correct term. And here are the new knurled headset spacers. I especially like the black ones with the silver trim. 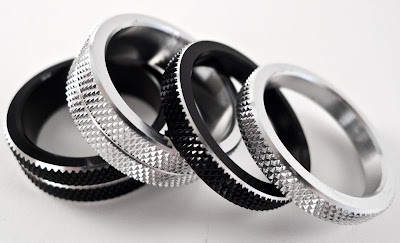 They look like old camera lens extension rings. 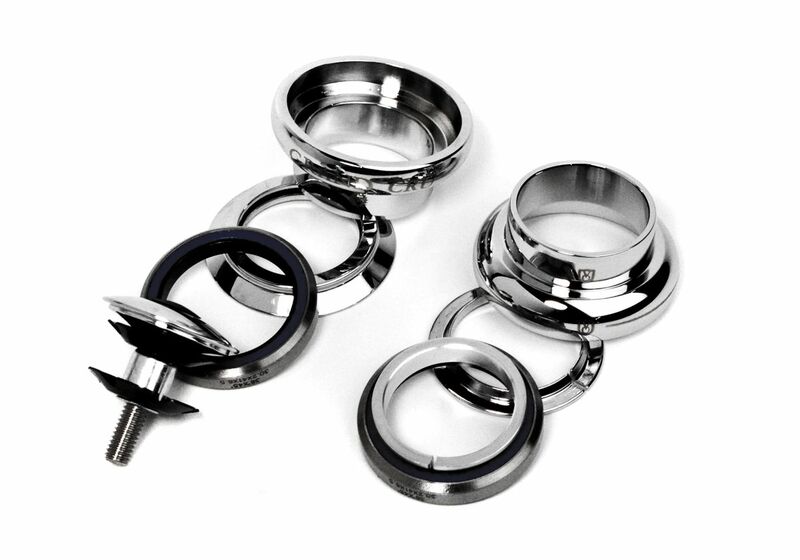 We have chrome spacers too. 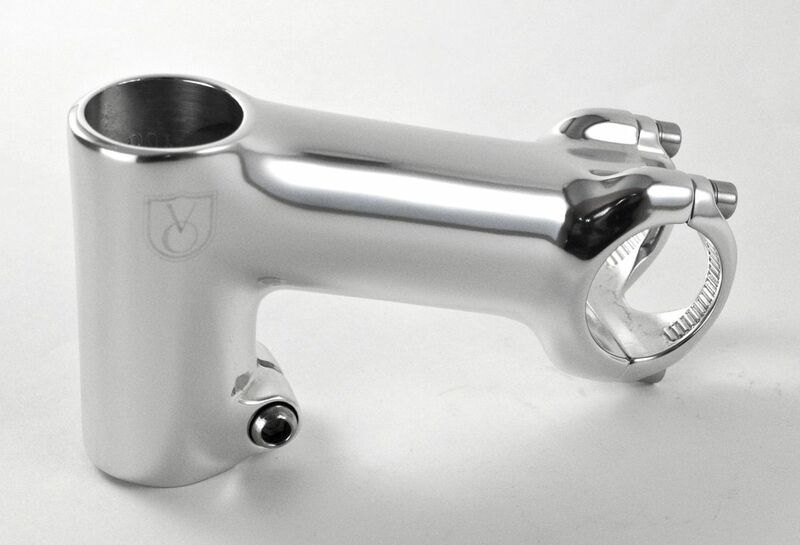 Here is a new VO stem. We're calling it the "Tall-Stack" until we think of a better name. Stack height is 75mm. It offers a really clean look on a modern bike. Angle is 17-degrees, for a level extension, and lengths from 80-110mm are currently available. Many of you asked for VO stems that fit 31.8mm handlebars. we now have them in both 6-degree and 17-degree versions. We also have new stem shims: 31.8mm-to-26mm and 31.8mm-to-25.4mm. There are several other new items we'll list soon. 400 cases of parts arrived on Friday and it'll take a few days to sort through everything. 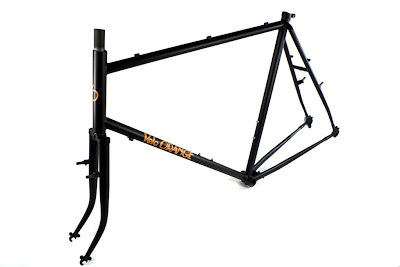 We're about to order a new production run of Polyvalent frames and are thinking of changing the color. The two top choices are dark green or dark brown (top or bottom left on the chart). We're leaning toward brown. But I thought I'd open it up to suggestions. 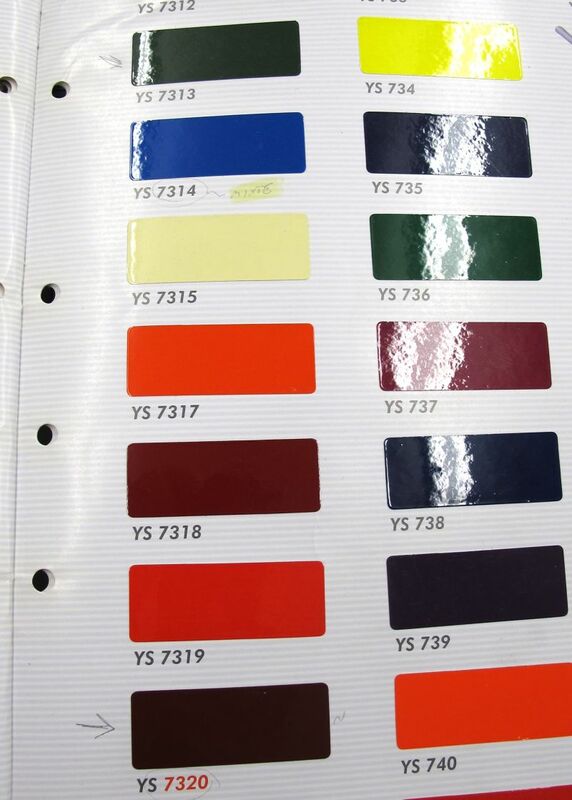 What's the best color for a city bike? The only color we've ruled out is blue, since we already have two other blue frames. 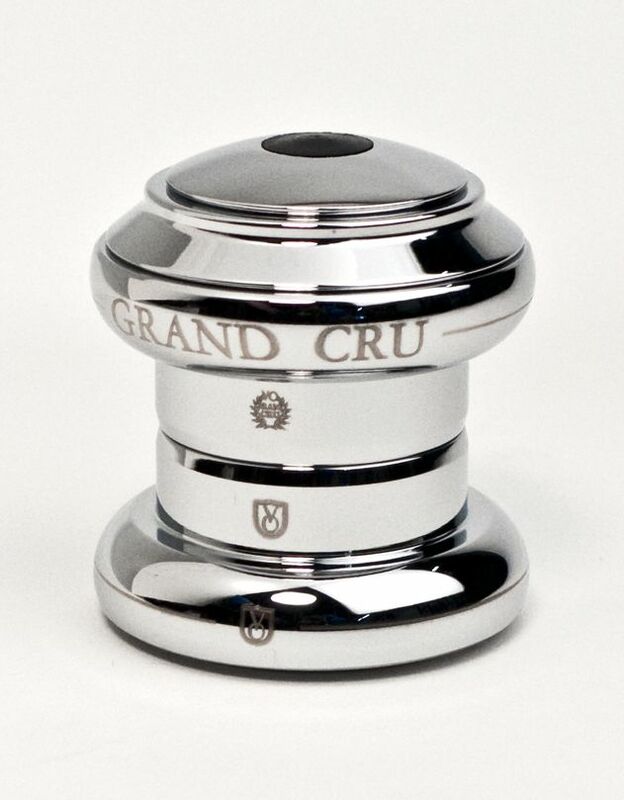 In our never-ending quest to make our products shinier and shinier we asked our headset factory about doing a second round of polishing on our already polished and anodized Grand Cru headset bodies. Instead, the factory prepared samples that were highly polished then lightly chrome plate. We were amazed; it was like a mirror finish. So we have headsets with a finish like those steel Campy headsets that I used in my youth, but with light weight alloy construction and with sealed bearings. These headsets are also more scratch resistant and have nicer graphics. We recieved a case of each size by air freight yesterday. The remainder will arrive by ship sometime next month, so we might run out before the ship docks. We should also be getting some neat knurled headset spacers and our roller-bearing headsets in that shipment. If it seems as if we've been working on fillet-brazed quill stems for years, it's only because we have. 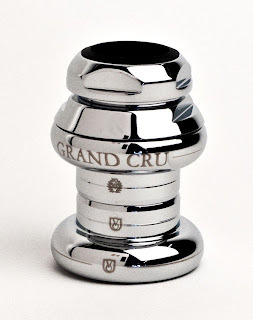 The photo at left shows the final prototype for the Grand Cru stem. It will have an alloy wedge and even come with a clamp bolt. As to the price, $75-$95 is a fair guess. We hope to have them this winter. 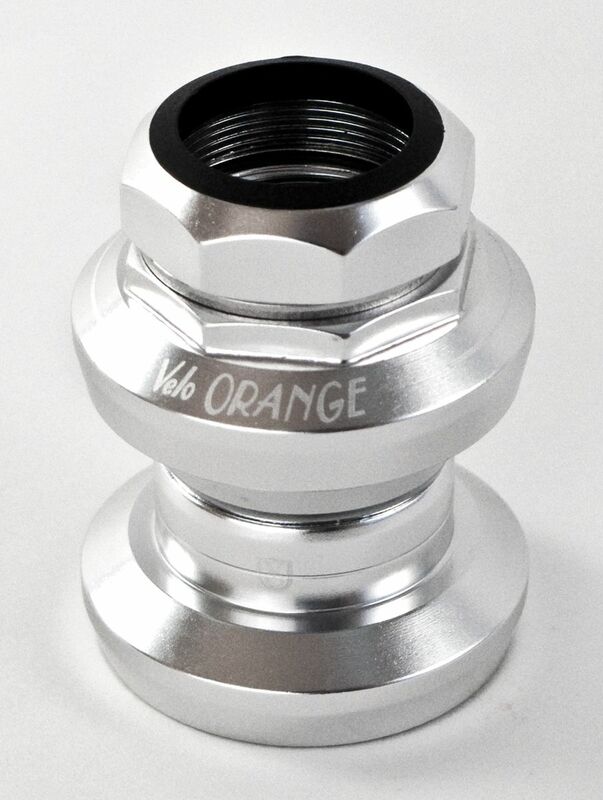 There will also be a simpler and less expensive VO fillet-brazed and chrome plated. I'll post details when we have the final prototype. It should be soon; we're very close on the design. Interestingly, these stems are about the same weight or lighter than a Nitto Technomic, but the quill is a little shorter. Update: Here is a post I wrote last year about Zen and the Art of Making Stems. 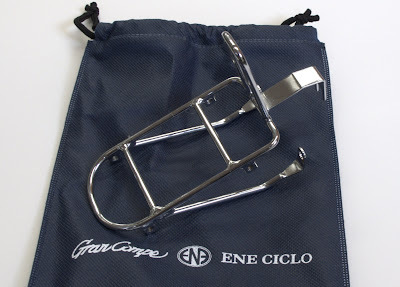 The draw bolts on the latest production run of Grand Cru Roller Straddle Wire Hangers do not meet our specifications. They can crack if overtightened. We sent out about 130 of these before spotting the problem. We've already sent e-mails to everyone who bought them, but in case you didn't get an e-mail I'm posting this. Not all roller hangers are effected, just one recent batch. Those can be sent back for a refund or replacement. Please contact us for more info if you bought roller hangers in the recent past. An easy check is to see if the bolt sticks to a magnet; if it does it's OK. Also, the good ones don't have a washer under the nut. The VO Compact Double cranks are here. But they are not as we specified. 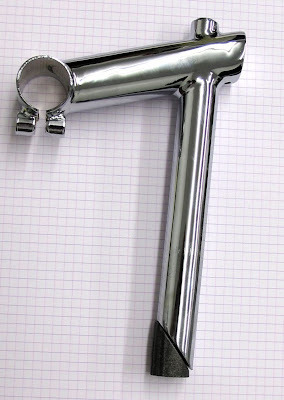 You may remember that we made a prototype that was chrome plated aluminum alloy. While it looked great and performed perfectly, most folks preferred a polished alloy finish, as on the triple and polyvalent cranks. Unfortunately, the change in specifications did not reach the factory and we have a shipment of chrome plated doubles. We've decided to sell these at a big discount. The price was to be $115, but this batch is $65 while they last. The factory still has many more chrome plated VO crank arms. Those will be assembled with polished alloy rings and priced normally. This winter we will have regular polished arms and rings. 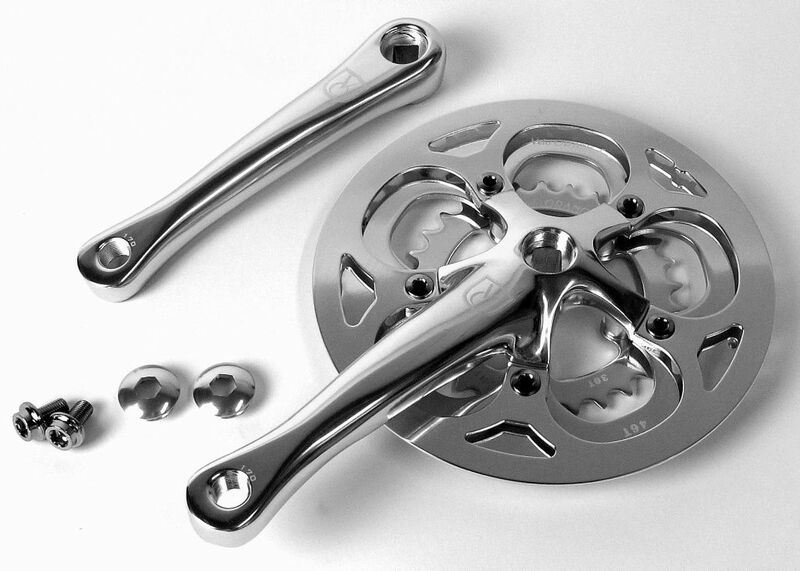 Again, we don't know of any problems or issues with the chrome cranks, they are simply not what we wanted. And they do look pretty cool. Update: All sizes sold out. The triple looks really nice. 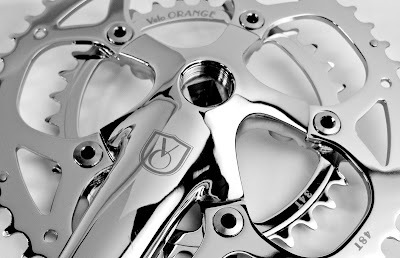 The VO Triple Crank is a modern, stiff, cold forged crank set. 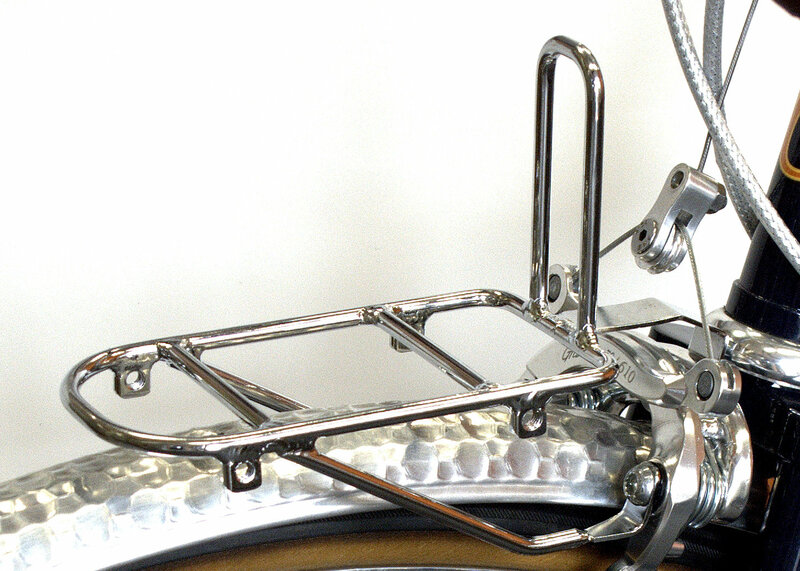 It has all alloy polished chain rings, 48/36/28. The rings are pinned and ramped for easy shifting. Machined alloy dust caps - not plastic - and nice BB bolts are included. At $125 these are a great deal. 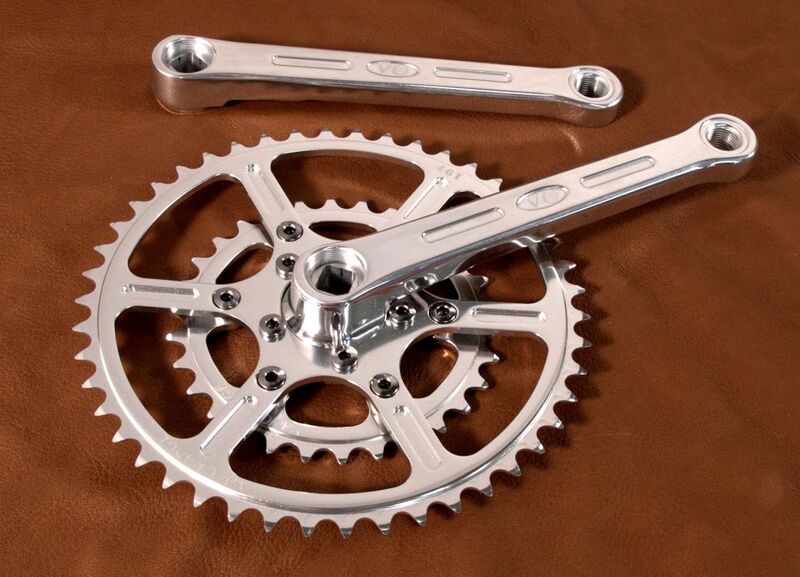 The wide range Polyvalent crank has 46/30 rings and comes with a polished alloy chain ring guard. The 46/30 rings give almost the range of a triple when used with a wide cassette, while the chain ring guard helps keep your pants clean. 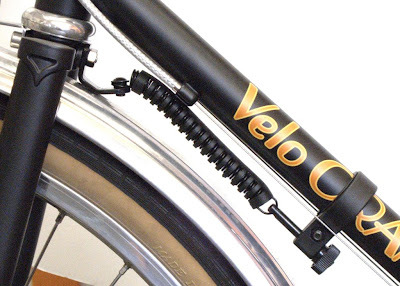 This is a great crank for city bikes and utility bikes. 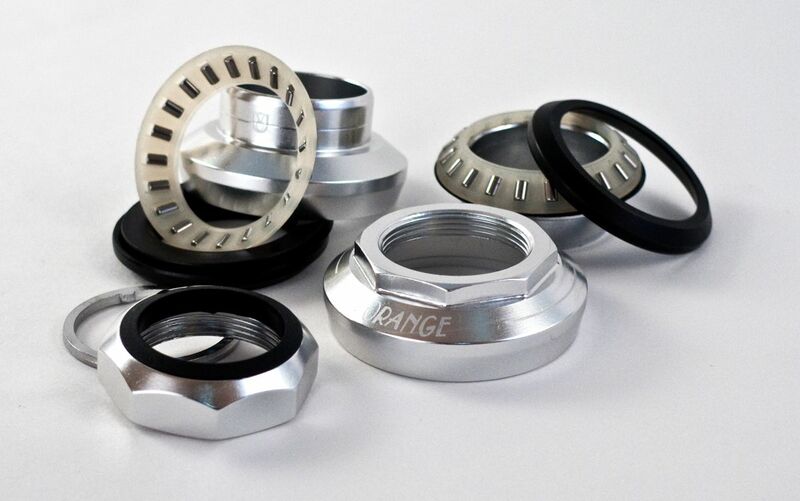 The 46t ring is specially designed to shift properly in the middle position. (A regular 46 outer ring won't work because it's spaced for the outer position mounting.) I want to use it with a VO chain guard on my own city bike; that will be a sweet setup. 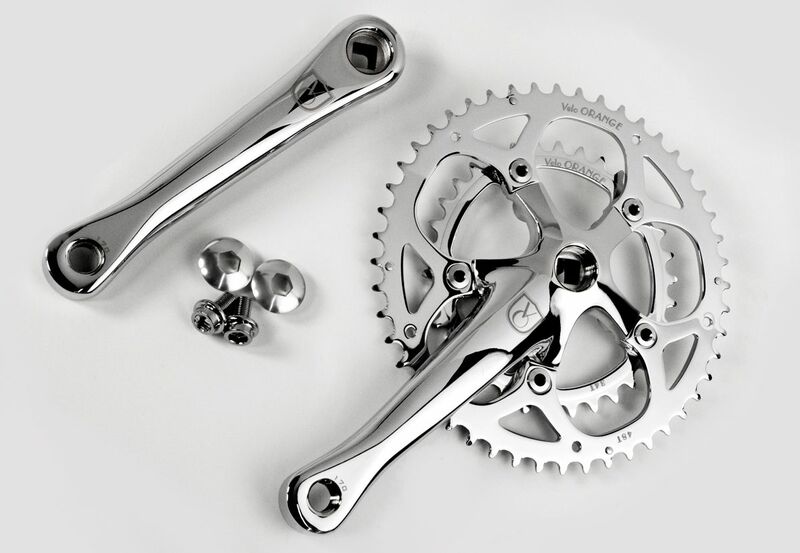 Classic 50.4 BCD cranks, like the TA, Stronglight 49D, and others are still sought after by randonneurs and cyclo-tourists. 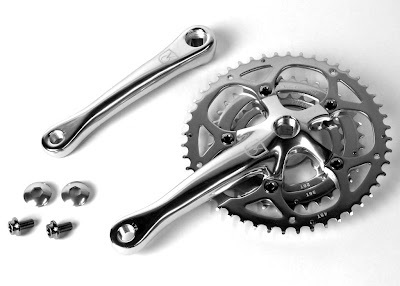 These cranks offer tremendous versatility (chain rings from 26t to 62t fit). They are also light and have very narrow Q-factors, or tread. 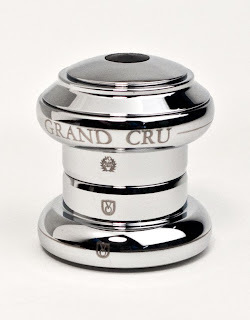 While the new Grand Cru Crank looks like the classics, we have made several important improvements. They are cold forged 7075 aluminum alloy. The rings are thicker so they don't flex as on classic cranks. The BB taper and all threading is common sizes, no need for special tools and BBs. The rings have modern shifting aids so shifting performance is much improved. I don't usually order accessories or components that I've haven't tried, but we'd received a fair number of e-mails suggesting that we stock wheel stabilizers. Tom has been lobbying for a year to add them to our inventory. What the heck is a wheel stabilizer? Wheel stabilizers are common on European utility bikes. They are a spring connecting the fork to the down tube. They add a subtle self centering action to the front wheel, making loading and unloading of a bike with a basket, or say....our Porteur rack....much easier. You don't fight the bike while putting stuff in it. The front of the bike stays put. The spring offers some resistance to steering, so it counteracts deflections from hitting potholes and road debris, too. It's pretty universal - any bike with a down tube of 1-3/8" or smaller can be fitted. 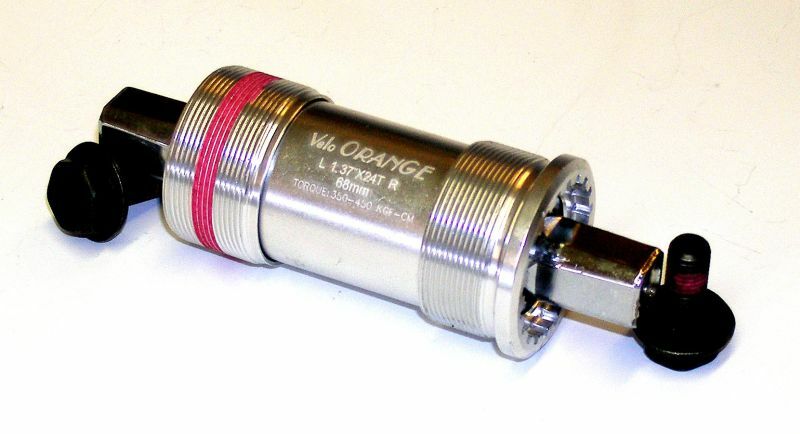 It connects to the fork via the brake pivot hole. The hole diameter is made for nutted calipers or a M6 bolt. For recessed mount calipers, minor modification with a drill is necessary. It's rust resistant, includes all the required brackets and hardware, and has a pinch guard to cover the torsion spring. Not bad for $10. Since we added them to the site a couple of days ago, they've been selling very well. Who would have thought? Update: We sold out. More are on order, but no ETA yet. The Gran-Compe ENE racks arrived today. These are much like the Mafac mini-racks and are designed to support a handlebar bag. (More info about the Mafac racks can be found here.) ENE racks mount directly to Gran-Compe 610 and Dia-Compe 750 centerpull brakes. There is no direct attachment to the frame so they can be used on any bike so long as the brakes fit. They are chrome plated steel and the platform is about 140mm x 70mm. The upright is about 75mm high. So they are the right size for an average handlebar bag, but too small for anything larger. There are four 5mm light mounts under the platform, two on each side. The rack sits level on most frames. At 160g these have to be among the lightest racks ever made. Cost is $50. The tag on the rack reads, "Designed only for GC610 & DC 750 brakes". Of course we tried it on several other centerpull brakes and managed to mount it on various Mafac (including Racers and Raids), Weinmann, and older Dia-Compe models. The mounting tangs are 68mm c-t-c, but can be flexed to spread or narrow a little. On another subject, we just received more Montmarte, Left Bank, and Porteur handlebars. A lot of you have been asking about these, so they'll probably sell fast. Threadless, which fit Swiss and several other odd sizes. 118mm BBs have been a little hard to find, but it's a very common size on older bikes, especially those with classic European cranks. 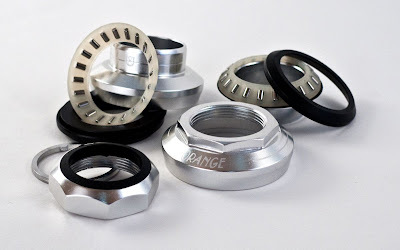 They will also be used with our new 50.4bcd cranks. BTW, we are overstocked on Italian thread BBs so they are on sale. 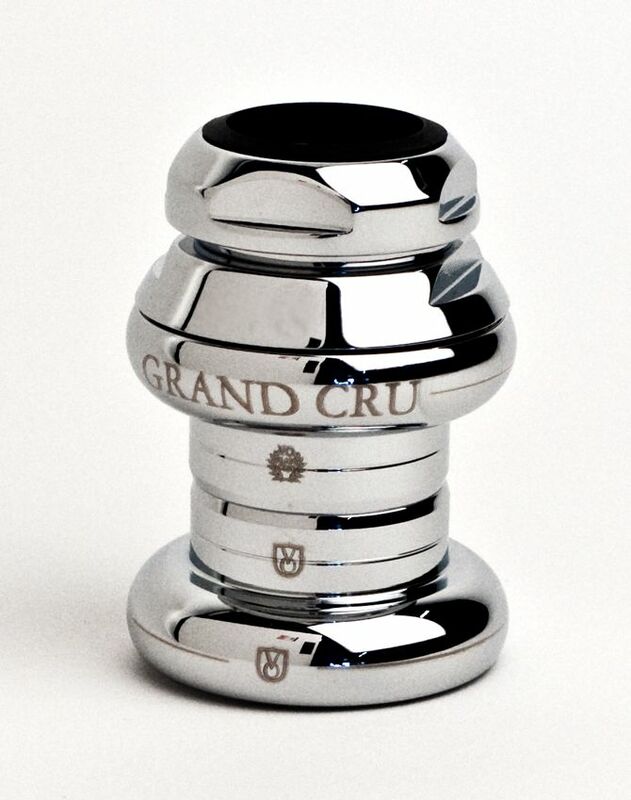 All Grand Cru bottom bracket have oversize sealed bearings and boron-steel hollow axles. Both cups are alloy. The quality is first rate. Axle bolts are included. 258gm average weight. JIS taper. A customer recently pointed out a troubling comment on a competitor's web site. He was speculating that our BBs were simply re-badged versions of some lower-quality BBs he sells. Not only is that untrue, but anyone in the bike biz knows it.